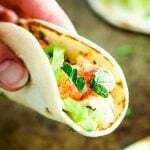 This Lobster Roll Taco recipe is a perfect game day appetizer idea – especially for New England Patriots fans! 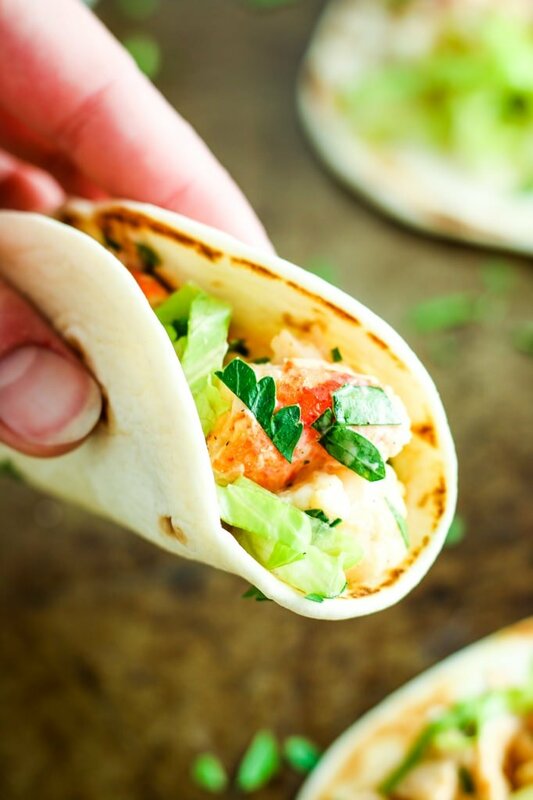 Load up street taco-style tortillas with this tasty lobster mix and enjoy with friends. 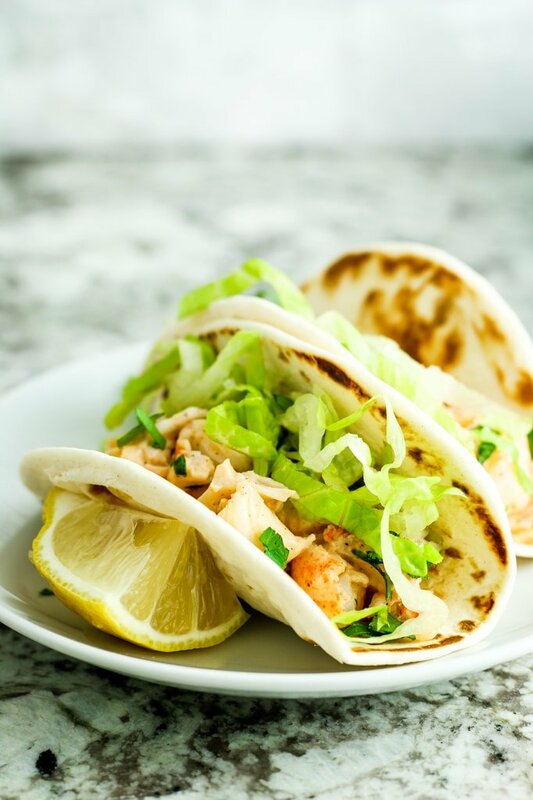 Lobster Roll Tacos. Yes, you read that right. No, you’re not dreaming. We’re going full-blown fusion with this recipe today and let me tell you – it’s AMAZING. Maybe it sounds crazy. We’re putting lobster roll filling in a tortilla? Yes, we are. A) Because we can and we should. B) Because Mission® Street Tacos Flour Tortillas are the perfect base for this situation. Soft, fluffy, and exactly the perfect size for snacking. And most importantly, we can stuff them with lobster. Mission also sent us their restaurant-style tortilla chips which I might have used to to dip extra lobster roll stuffing, and of course, salsa later on. These tacos are exactly the kind of appetizer I like to eat during a game. I don’t really mess around with munchies or sweets. I like handheld food that delivers a maximum flavor party and that’s exactly what these tacos are. Miniature, street-taco-sized lobster rolls – BOOM. No matter who wins, I think YOU guys should win too. 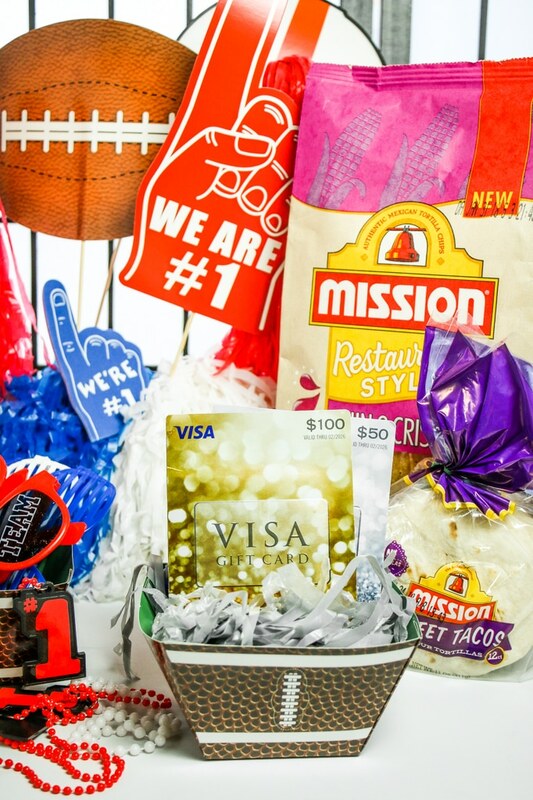 Mission is doing a sweepstakes so that you can get the CHANCE TO WIN your own team’s game day party kit. 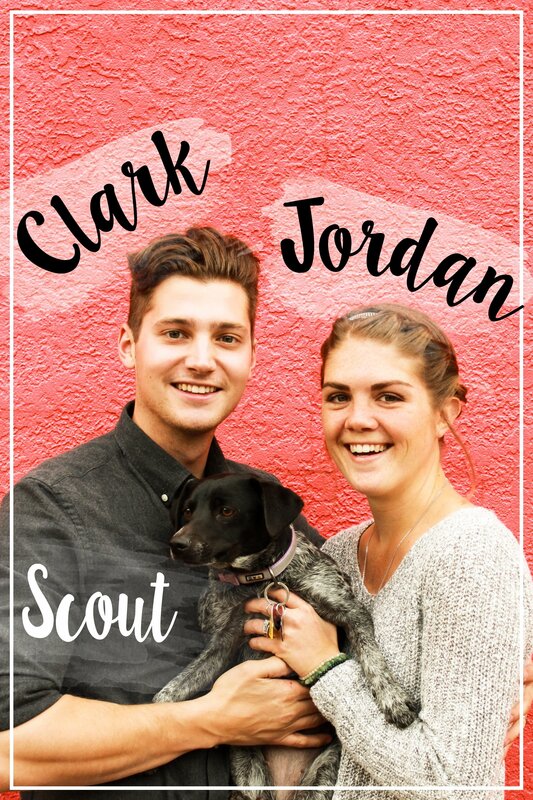 Prizes include a Roku® Streaming Stick®, party decorations, a recipe card for your favorite team (maybe mine! ), and a 70-inch 4K TV. It’s running from January 1st through February 4th so go enter the sweepstakes and get a piece of this action! Even if you’re not a Patriots fan (I won’t judge you), you will LOVE these tacos. If you guys make them, let us know – tag us on Instagram so we can see your creation in action! 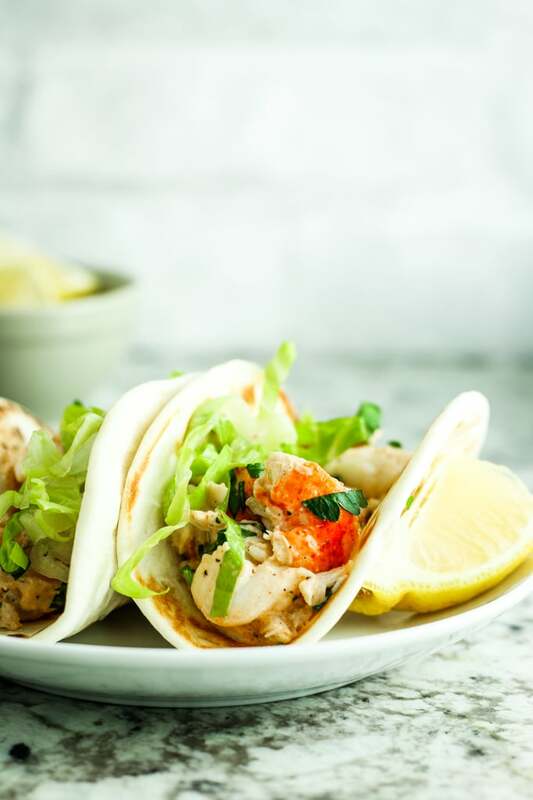 This lobster roll taco recipe is a perfect game day appetizer idea – especially for Patriots’ fans! 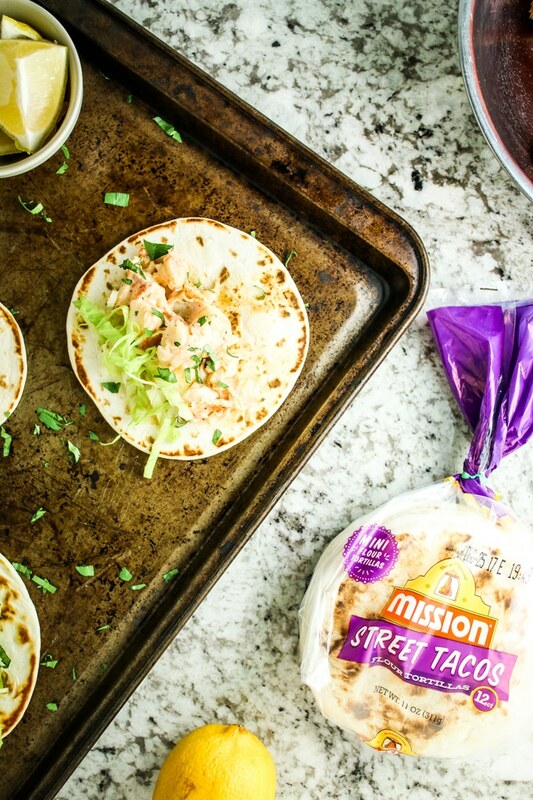 Load up street taco-style tortillas with the lobster mix and enjoy with friends. In a large pot, bring water to a rolling boil. Add salt and lobster tails. Boil 10-12 minutes until the shells turn red. While the lobster is cooking, make the sauce! Combine mayonnaise, lemon juice, parsley, sriracha, pepper, and cayenne in a small bowl and whisk together until smooth. Once lobster is finished cooking, use tongs to remove them from the pot and set aside to cool. When they’re cooled enough to handle, strip the meat from the shell. Chop roughly into 1/2″ pieces. Add chopped lobster to a bowl and pour the sauce over. Stir together until the lobster is well-coated. Scoop about 1/4 cup of the lobster mixture into the tortillas. Top with fresh parsley and romaine and enjoy! You had me at lobster rolls so, I’m sold. I am probably the greatest fan of lobster rolls so lobster tacos are an absolute must. Thanks for sharing! Oh man… lobster rolls are just the best! Enjoy! Oh deary me, these sound incredible!!! Absolutely gorgeous! Love the Patriots and love the sound of these delicious tacos! What an amazing combo! Yay! A fellow Pats fan. :) Enjoy! I hate hate hate the Patriots, so I feel very conflicted about this post. I think my hatred of the Patriots far outweighs my enjoyment of lobster, so instead, I’ll think about this as a delicious appetizer for a summer BBQ, rather than something remotely appropriate to serve for a football related gathering. Awwwwhhh… bummer! In the end, it’s all about having fun anyway – at least in my opinion! Wow, these sound amazing! I have to admit that I’ve always found cooking lobster a bit intimidating, but I need to get over it so I can make delicious foods like this! I was intimidated by lobster before trying it – it’s really quite easy! Such a delicious taco idea! I love the fusion of lobster rolls and tacos! Yes! Like fish tacos but better! I’m craving these right now. Lobster rolls are one of my all-time favorite meals! Having them in taco form is genius. Yum! I love lobster rolls! what a great idea to use tortillas in place of rolls. Agreed! Jazzes things up a bit! Oh – I was introduced to lobster rolls in Maine, some years ago – loved the filling, but I was just not that fond of the bun. But doing it as a taco, now, there’s an option! Dare I say it… I think tortillas are better than rolls anyway! Holy yum! I haven’t tried the Steet Taco Tortillas yet. They look perfect for a hearty filling like lobster. These look amazing! You should definitely try them! I love them for regular taco night too! Tacos are always a good choice. :) Love the sound of this sauce! Looks so bright and flavorful, yum! Had no idea Mission made street tacos! Lobster sounds amazing. Unfortunately, Lobster is so expensive in North Carolina. Unlike our New England, where we were raised. I didn’t know they did either until recently! Love the size of them though. Ah… that’s a bummer! This is perfect for game day! I’ll have to share this with my friends who are lobster fans! Thank you. Love love love these tacos…what a great idea! My mouth is watering!! I love lobster and I love tacos! Now I can have them both in the same dish. Except I follow a grain free diet so I will just put this yummy lobster in romaine leaves and have lettucewrap lobster tacos. Thank you! Lobster roll tacos???? Yes please! These sound fabulous! We used to have this awesome little restaurant in town that made killer lobster tacos. They closed unexpectedly one day and I have craved them so much since then! This recipe looks like it may be the perfect one to fill my lobster taco void. I can’t wait to try it! I have never had a lobster roll. So sad I know. Thanks for the inspo! Your pictures are really inviting, I am craving these right now. Such beautiful tacos and stuffed with amazing ingredients. Right up my alley! I am officially drooling – could these look any more delicious! I can’t wait to try this with Mission tortillas! These will be a big hit at parties! So creative and different! Love it! Lobster roll tacos?! You just combined two of my favorite things. I know it’s not Taco Tuesday yet but I wanna make this right now! This recipe is unbelievable. I cannot WAIT to make these! I was drooling over these on social media! We got a wine in our wine club shipment that has a pairing of lobster rolls and came with a recipe but it didn’t appeal to me. Now I know what I’m making to pair it with! Check to see if Valentine’s falls on a Tuesday but nope Wednesday. Lobster roll tacos sound phenomenal! I think if I had these I’d want them all the time! 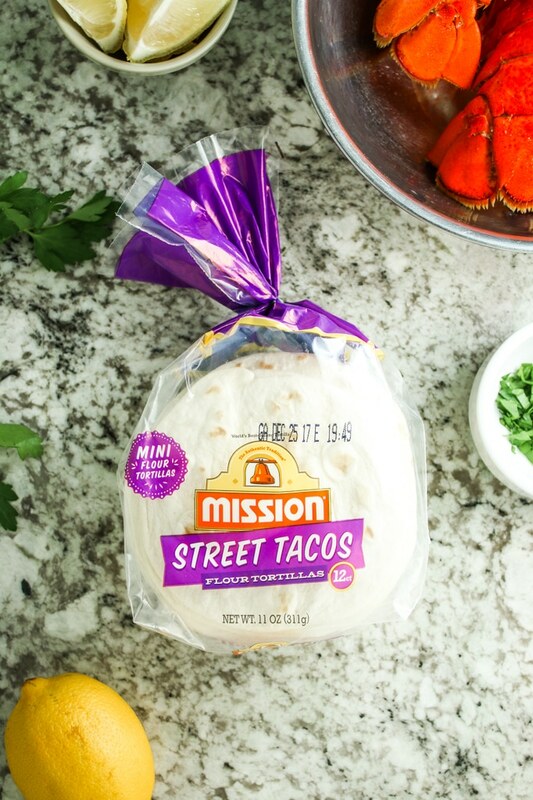 I had no idea Mission made those adorable street taco tortillas! Considering my husband and I were just discussing a mutual taco craving last night, I’m pretty sure my seeing this post is fate. Now to find some good lobster! These tacos sound fantastic! Hubby and I haven’t missed a Taco Tuesday since February or March of 2014! We even planned our Honeymoon around our ability to get tacos! Can’t wait to add these to our taco rotation! This is the best idea ever to make lobster tacos. I probably woudn’t make it for a group, but for my husband and I yes! Yummy! I don’t eat lobsters that much but this post has gotten my taste buds ready for it! They look delicious! I’ve never seen lobster tacos anywhere, and I even grew up on the east coast where lobster was everyyyywhere. You guys got pretty crafty on this one. Great job!